Manufactured in Indonesia since 1951, Djarum Filtered Cigars are created with high-quality blends of flavorful tobaccos infused with real cloves, naturally wrapped in a high-grade tobacco leaf. Each Djarum produces a rich full-bodied flavor and aroma that is true to traditional smokes. Locals like to refer these elegant filtered little cigars as 'kretek' implying to the crackling sound of the cloves as they burn inside once the filtered cigar is lit. 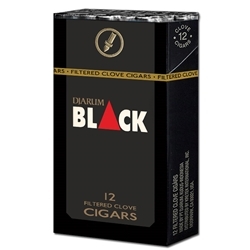 Smokers Discounts believes Djarum Filtered Cigars can be the right fit for your everyday smoking needs, and we can deliver these premium smokes right to your front doorstep. A variety of flavors are listed below. Each of these styles are in stock and available for a low discount price! Call us for more details!